Why do Europeans and Americans see the world so differently? Why do Europeans and Americans have such different understandings of democracy in the twenty-first century? Why is Europe dying, demographically? In "The Cube and the Cathedral," George Weigel offers a penetrating critique of "Europe's problem" and draws out its lessons for the rest of the democratic world. Contrasting the civilization that produced the starkly modernist "cube" of the Great Arch of La Defense in Paris with the civilization that produced the "cathedral," Notre-Dame, Weigel argues that Europe's embrace of a narrow and cramped secularism has led to a crisis of civilizational morale that is eroding Europe's soul and failing to create the European future. Even as thoughtful Europeans and Americans wrestle with these grave issues, many European political leaders continue to insist-most recently, during the debate over a new European constitution-that only a public square shorn of religiously informed moral argument is safe for human rights and democracy. 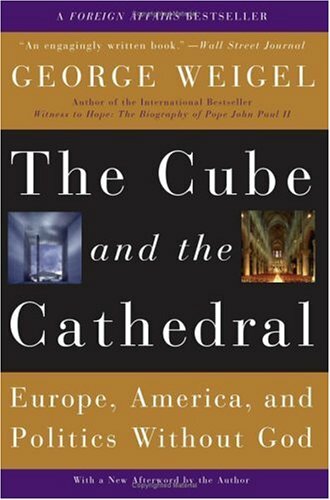 The most profound question raised by "The Cube and the Cathedral" is whether there can be any true "politics"-any true deliberation about the common good, and any robust defense of freedom-without God. George Weigel makes a powerful case that the answer is "No"-because, in the final analysis, societies and cultures can only be as great as their spiritual aspirations.